NIAGARA FALLS — Just one day after Statistics Canada revealed the number of seniors in this country has exceeded the number of young people aged 14 and under for the first time ever, an association representing hundreds of long-term care homes in Ontario issued an urgent plea for the province to make the care of seniors a priority. At the Bella Senior Care Residence in Niagara Falls on Wednesday, Sept. 30, Ontario Long-Term Care Association chief executive officer Candace Chartier said too many seniors are living in homes that need to be modernized and rebuilt. With the number of seniors in Ontario expected to skyrocket in the coming years, and dementia cases set to explode in number, immediate investment in long-term care homes is critical, said Chartier. extremely aggressive behavior, she said. “The biggest thing we’re hearing (from families) is we need more staff,” said Chartier. But the physical limitations of existing homes must also be addressed, she said. Many homes have narrow hallways crammed with med carts, no storage space and large, crowded dining areas that can cause people with dementia to become very agitated, said Chartier. By contrast, the Bella residence has wide hallways, quiet, intimate dining areas, a “beautiful” therapeutic garden and private rooms, she said. It also has palliative care room with adjoining family room where loved ones can sleep and shower instead of having to crash at a motel. The palliative care allows dying people to live out their final days in dignity rather than wasting away in a hospital emergency room or bed, said Chartier. Rapidly shifting demographics will make addressing homes’ shortcomings quickly crucial, said Chartier, noting it can take three years after shovels go in the ground for a home to be rebuilt or redeveloped. Her association said the number of seniors in Niagara over age 75 will grow by 40 per cent in 10 years, and by 98 per cent over 20 years. Already, more than half of seniors living in Niagara homes — about 1,678 people — live in homes that are outdated and need to be modernized, said Chartier. Her association is calling on the province to implement a plan to modernize outdated homes, and provide the funding needed to hire adequate numbers of staff. It’s also calling for the establishment of dedicated dementia and mental health support teams in every home. “There’s not a home in the province that doesn’t need that expertise,” said Chartier. With an ever-growing number of seniors needing long-term care, it’s more important than ever for the investments needed to deal with the rapidly aging society, said Chartier. 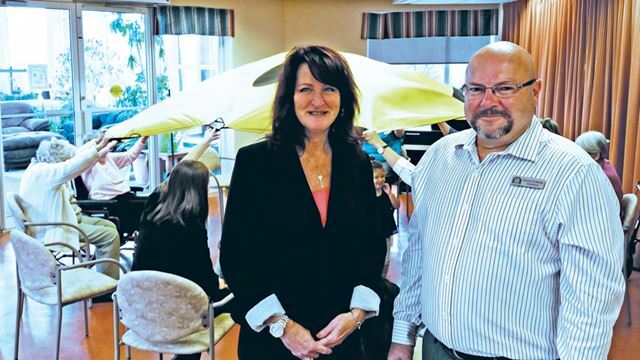 In photo: Ontario Long-Term Care Association Chief Executive Officer Candace Chartier is joined by Bella Senior Care Residence administrator Dale Cowan.